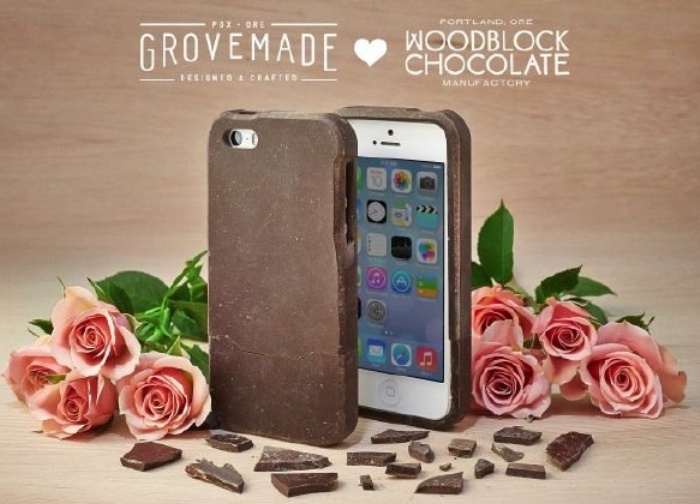 So This is an iPhone Case Made From Chocolate | OhGizmo! Phone cases come in all shapes, sizes, and designs. One of the most unusual we’ve seen so far are these iPhone cases made from blocks of dark chocolate. The cases are a result of a love project by Grove, which is a designer of handcrafted wooden tech accessories, and Charley Wheelock of Woodblock Chocolatete. The edible chocolate cases are compatible with the iPhone 5, 5S, and 5C. Like most cases, they allow access to the phones various ports and buttons. They’re described as being sleek and thin, and even smooth to the touch. They probably won’t stay that way, especially if the phones are being used in the sunny outdoors. ← A New Kind of SMS: Smoke Messaging Service?